We’re writing to you today because you signed our petition to the United Nations calling for a Korean peace conference that would replace the temporary armistice establish a long-lasting and just peace in the Korean peninsula. Our work around this issue has been paying off already: We are delighted to announce that Representative Conyers, Rangel and Johnson (all three Korean war veterans!) have introduced Congressional legislation calling for a formal end of the Korean War. We applaud their efforts to end this over 60-year-long conflict. The delegation we joined in May, Women Cross the DMZ, was a great success. 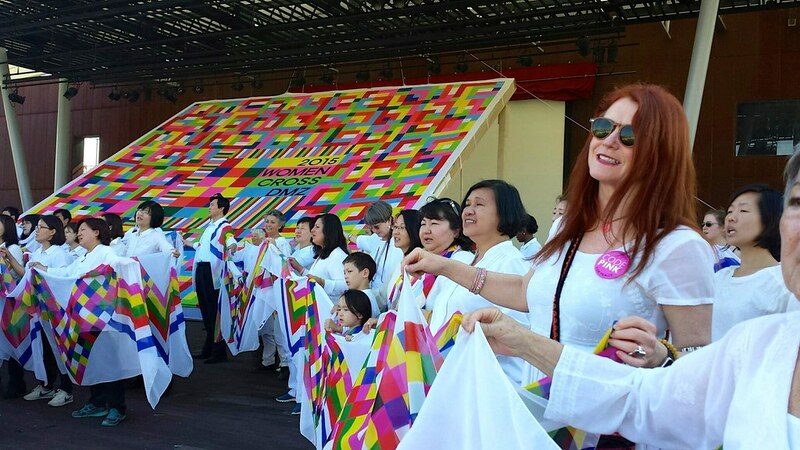 The delegation of women, including CODEPINK co-founders Medea Benjamin and Jodie Evans, made incredible connections with our sisters in both North and South Korea, hearing stories and testimonies in support of peace and reunification. Read an in-depth reportback by Jodie in her article Stitching Korea Back Together After Sixty Years of Military Divide and check out photos and a compilation of the press coverage from the trip. In Washington DC, we hosted a congressional briefing about the trip with a panel of the trip delegates including Women Cross the DMZ founder Christine Ahn, feminist writer Gloria Steinem and documentary-maker Abigail Disney. The briefing was supported by Representatives Barbara Lee, Charles Rangel, and John Conyers. We have hosted successful reportback events in Washington DC, Los Angeles and Philadelphia. We participated in the Korean Armistice commemoration event on July 27th. We’ll join the Coalition of Koreans in America at the White House on August 15th on the occasion of Korea's liberation from Japanese colonialism seventy years ago, calling for an official end to the Korean War. We hope you'll consider joining us for one or more of our upcoming delegations to Cuba and Palestine. Check out more information on our website! Thank you for your continued support for our work. We couldn’t do it without you!